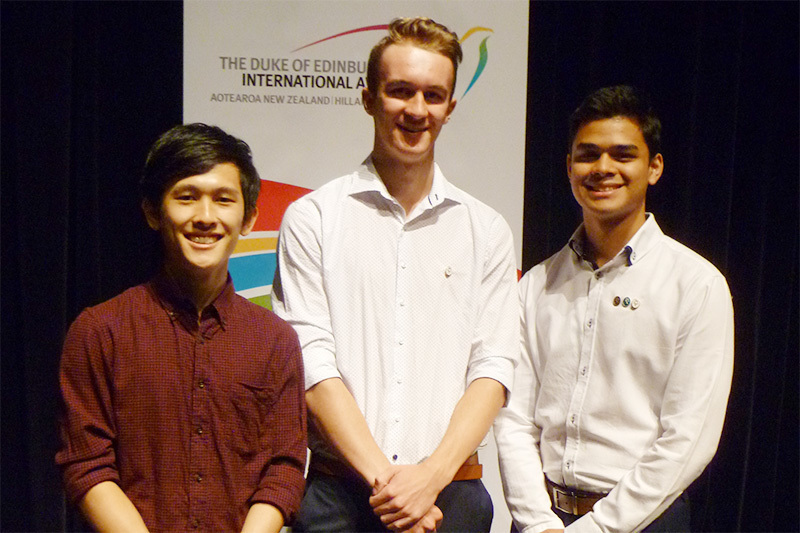 Three former Macleans College students were recently awarded their Gold Award in the Duke of Edinburgh’s International Award at Kristin School, Albany. Rahil John (2014 - 2018), formerly of Kupe House, Andrew Power (2013 – 2017), formerly of Mansfield House and Richard Tang (2013 - 2017), formerly of Te Kanawa House are all studying Engineering at the University of Auckland. Andrew and Richard are in their second year and specialising in Engineering Science and Mechanical Engineering respectively, while Rahil is doing first year Engineering. The Awards were presented by Sarah Hillary and represent four years of community service, sport, tramping and learning a new skill. The Duke of Edinburgh’s International Award is the world’s leading youth achievement award, open to all 14 – 24 year olds. The award is comprised of three levels (Bronze, Silver and Gold) and four sections – Skills, Service, Physical Recreation and Adventurous Journey. Left: Richard Tang, Andrew Power and Rahil John.